See below for a full, searchable version of this graphic. Queen City property values are so undervalued for tax purposes that the State of Vermont is likely to order a citywide property reappraisal — a move that could result in higher tax bills for homeowners. The local tax roll lists Burlington's property at 79.4 percent of its actual value, according to state calculations — making the city the most "under-assessed" of the 256 communities measured in the state. It has been 12 years since the last full reappraisal, and the real estate market has been through some downs and ups. Since the Great Recession hit in late 2007, prices have not only recovered but have risen sharply, particularly for single-family homes. Under state law, any percentage below 80 percent triggers a mandatory order for reappraisal. City assessor John Vickery appealed the state's figure and is negotiating with officials at the Vermont Department of Taxes who've tentatively upped it to 79.9 percent. He'll meet with them later this month to finalize the number. But one way or another, Vickery warned, Burlington will be ordered to reassess this year or next. "It's needed; it's time to do one," he said. If the state issues an order, the city will still have a few years to comply. While the methodology isn't likely to interest the average joe, the results almost certainly will. Last time around, they generated contentious debate. Some people's tax bills went down, others stayed the same and some went up. This time around, there will again be winners and losers. "There's always a lot of energy around the reevaluation, oh boy," said Vickery. "It affects everyone — at least everyone that pays taxes. So it's a big deal." The undertaking would cost about $1 million, and an outside firm would conduct it, according to Vickery. The city could issue a request for proposals later in 2018 with a goal of doing the work in a year or so. Appraisers previously went into neighborhoods and inspected properties from the exterior; they looked inside, too, with the permission of property owners. Single-family home sales are driving much of the appreciation. The median price last year on a Burlington residence was $315,000, up 7.9 percent from 2016, according to the Northwest Vermont Market Report by Coldwell Banker Hickok & Boardman Realty. Sales prices of Queen City condos rose only slightly, by 0.5 percent, to a median of $235,000. The cost of commercial property has also increased, according to Vickery. Such appreciation has pros and cons, said Mayor Miro Weinberger. "I'd say, for property owners, healthy appreciation is a good thing," he said. It makes real estate a good investment. "The flip side of that coin is that it can have a negative impact on affordability," the mayor continued. Many prospective home buyers are already priced out of the Burlington market. Weinberger, a former developer who advocates for building new housing units, was reelected Tuesday. Tweaks to the property-value calculation would have the greatest impact on the municipal portion of every Burlington homeowner's tax tab; the city's share accounts for approximately one-third of the bill. The other two-thirds represent the school tax, to which the state already applies a formula to correct for real estate fluctuations. How? The state surveys some 20,000 property sales across Vermont for an annual study designed to make state education taxes fair and ensure that property is taxed at fair market value from town to town. By comparing three years of sales in each municipality to tax assessments, the state derives a figure known as the common-level of appraisal, aka CLA. If the number is more than 100 percent, it means property assessments are above actual market value and the school tax rate is adjusted downward. If the figure is lower than 100 percent, it means assessments are below market value, and the rate is adjusted upward. In Burlington, much of the nearly 8 percent school tax increase associated with the fiscal 2019 school budget that voters approved on Tuesday was a correction due to the city's under-assessment. "From the state perspective, we just want people to be paying a fair amount," said Douglas Farnham, policy director and economist at the Vermont Department of Taxes. And while the annual CLA correction helps, state law mandates reappraisals when more thorough adjustments are warranted. The last time that happened was in 2010, when the state ordered Concord, Salisbury and Whiting to reassess because their common levels of appraisal fell below 80 percent. It's more common for the state to order reassessments when a separate measure shows that property is assessed unevenly within a municipality. That's not the case in Burlington, where data show properties are in compliance. Burlington's CLA has been drifting downward for several years, from 87.5 percent in 2016 to the current level of just under 80 percent. The community with the second-lowest CLA in the state is Middlebury, at 84.7 percent. Most municipalities in Chittenden County are in the 90th percentile: Winooski at 91.4; South Burlington, 94.5; and Milton, 98.1. A significant number of towns, especially in southern Vermont and the Northeast Kingdom, are overassessed, according to the tax department. Danby has a CLA of 125.2 percent; Guildhall, 120.7. Overassessment does not trigger the state to order a community-wide reappraisal. 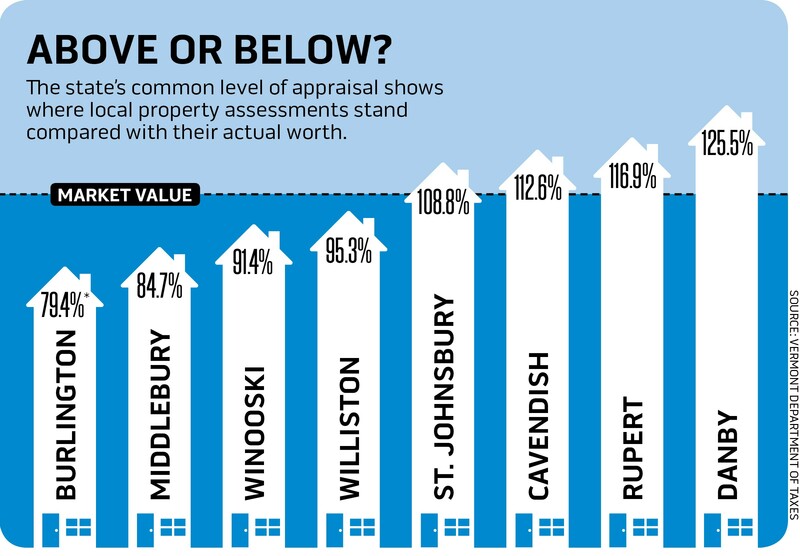 Burlington does adjust assessments between citywide reappraisals for various reasons. Major home improvements can trigger an increase, as can mini-trends. A surge in high-dollar sales for apartment buildings a few years ago prompted new assessments for that class of property. A slackening in the condo market led to lower assessments for several properties in Burlington. Meanwhile, Vickery is researching potential firms to conduct Burlington's citywide appraisal. "I want to start the planning process now," he said. "We want our study to be accurate." How Do Market Values and Tax Assessment Values Match Up for Properties in Your Town?